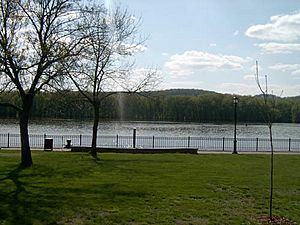 Often referred to as Wisconsin's second oldest city, Prairie du Chien was established as a European settlement by French voyageurs in the late seventeenth century. The city is located near the confluence of the Wisconsin and Mississippi Rivers, a strategic point along the Fox-Wisconsin Waterway that connects the Great Lakes with the Mississippi. Early French visitors to the site found it occupied by a group of Fox Indians led by a chief whose name Alim meant Chien in French (Dog in English). 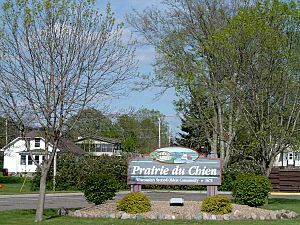 The French explorers named the location Prairie du Chien, French for "Dog's Prairie". Originally this name applied only to the plain upon which the settlement is located, but it was later extended to mean the city as well. 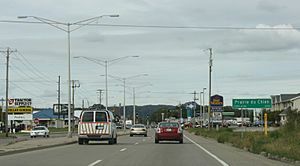 The city of Prairie du Chien is located between the Town of Prairie du Chien and the Town of Bridgeport. The first Europeans to reach Prairie du Chien were the French explorers Jacques Marquette and Louis Joliet, who arrived by canoe on June 17, 1673, discovering a route to the Mississippi River. 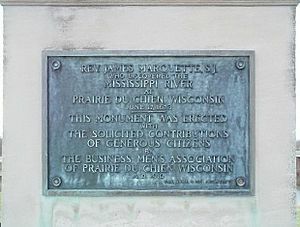 Later travel between French Canada and the Mississippi River passed through Prairie du Chien, although routes via the Illinois River were also used. In 1685, the French explorer Nicolas Perrot established a trading post in the area as part of the large and lucrative French fur trade industry. After Americans entered the trade in the nineteenth century, John Jacob Astor built the Astor Fur Warehouse, an important building in the regional fur trade whose business was done in Prairie du Chien. The significance of Prairie du Chien as a center of the fur trade did not diminish until the mid-nineteenth century. In 1763, when Great Britain defeated France in the French and Indian War (part of the Seven Years' War), it took "possession" of the French territory in North America, including Prairie du Chien. The British expanded the fur trade during their occupation of the area. During the American Revolutionary War, the city was used as a meeting point for British troops and their Native American allies. After the American victory, the Treaty of Paris (1783) granted the area to the new United States of America, but the British and their Loyalists were slow to withdraw. Only after the War of 1812 did the city become fully American. 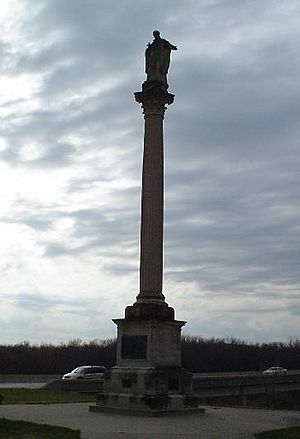 The US was slow to present any authority over Prairie du Chien, but late in the War of 1812 when the government realized the importance of holding the site to prevent British attacks from Canada, it began construction of Fort Shelby in 1814. In July, British soldiers captured the fort during the Siege of Prairie du Chien. The British maintained control over the city until the war's end in 1815. Not wanting another invasion through Prairie du Chien, the Americans constructed Fort Crawford in 1816. The fort was the site of the negotiations and signing of the Treaties of Prairie du Chien (1825 and 1830), by which the Fox and Sauk ceded much of their land to the US. Representing them and the United Nations of the Chippewa, Ottawa and Pottawatomie in the 1829 negotiations was Billy Caldwell, of Scots-Irish and Mohawk descent. He became involved with the Pottawatomie after moving to the US as a young man from Canada. In 1829, the army doctor William Beaumont carried out many of his famous experiments on digestion in the hospital of Fort Crawford. Beaumont's discoveries are still the basis of current knowledge on the human digestive process. Col. Zachary Taylor, who later became the 12th U.S. President, was the commanding officer at Fort Crawford during the Black Hawk War of 1832. Taylor oversaw the surrender of Black Hawk in Prairie du Chien. Lt. Jefferson Davis, who later became president of the Confederate States of America, was stationed at Fort Crawford at the same time. Here Jefferson Davis met Zachary Taylor's daughter, Sarah "Knoxie" Taylor, whom he married in 1835. Outside the walls of the fort, early nineteenth century life in Prairie du Chien was still dominated by the fur trade. Prairie du Chien's most well-known traders during this time were Michel Brisbois, Joseph Rolette, Nathan Myrick, and Hercules L. Dousman. Dousman built a fortune in the fur trade, which, combined with income from investments in land, steamboats, and railroads, propelled him to become the first millionaire in Wisconsin. Dousman died in 1868, and his son, H. Louis Dousman, inherited much of his fortune. In 1870 Louis Dousman used his inheritance to construct a luxurious Victorian mansion over the site of the former Fort Shelby. When Louis died unexpectedly in 1886, his family renamed the home "Villa Louis" in his memory. The Dousman family continued to occupy the home until 1913. Nearly 40 years later, in 1952, the mansion became Wisconsin's first state-operated historic site. After the fur trade declined in the mid-nineteenth century, Prairie du Chien's attention shifted to agriculture and the railroad. Although the city was first connected to the Milwaukee & Mississippi Railroad in 1857, the width of the Mississippi River posed a challenge for further expansion of the railroad into Iowa. This problem was temporarily solved by disassembling the trains at Prairie du Chien and ferrying them across the river to be put back on the tracks on the other side. A better solution was found by Michael Spettel and John Lawler, who designed a permanent pontoon bridge to span the river in 1874. Lawler took most of the credit for this invention, and made a small fortune through its operation. Lawler later donated property to establish two Catholic boarding schools in Prairie du Chien, St. Mary's Institute (now Mount Mary College of Milwaukee), and Campion High School in the later part of the century. 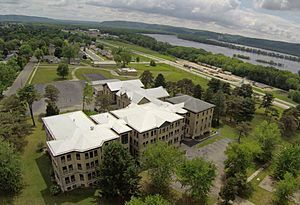 St. Mary's College remained in Prairie du Chien until 1928 Campion High School produced several notable alumni including Vicente Fox, Congressman Leo Ryan, Governor Patrick Lucey, actors David Doyle, George Wendt, and Kevin McCarthy, and writer Garry Wills. Campion was closed in 1975. In 1828, the Prairie du Chien area became a part of the Town of St. Anthony, a town which included all of immense Crawford County. (Crawford County itself included all of the western part of Michigan Territory.) In 1849, the Town of Prairie du Chien was created, consisting of most of present-day Crawford County. The city of Prairie du Chien was then incorporated in 1872. The Mississippi River, viewed from St. Feriole Island. Prairie du Chien is located within the Mississippi River Valley, upon a long triangular plain that is bounded on the west by the Mississippi River, on the south by the Wisconsin River, and on the east-northeast by a series of tall bluffs. According to the United States Census Bureau, the city has a total area of 6.36 square miles (16.47 km2), of which, 5.63 square miles (14.58 km2) of it is land and 0.73 square miles (1.89 km2) is water. While the city's area encompasses most of the plain upon which it sits, portions of the plain extend outside city limits. Just north of the city limits, where the plain forms part of the Town of Prairie du Chien, there is a small unincorporated settlement known locally as "Frenchtown". The plain also extends outside the city southward into the Town of Bridgeport. Here the plain ends, becoming the wetlands of the Wisconsin River Delta. Both inside and outside the city limits, backwaters of the Mississippi River occasionally break across the far west side of the plain to form small islands. While most of these islands are too small and flood prone to have ever been inhabited, one larger island just west of downtown Prairie du Chien formed the city's fourth ward until a 1965 flood prompted a mandatory relocation of the island's residents to higher ground. During the relocation project, most buildings with no special historical significance were removed. Now called "St. Feriole Island", the island serves as a 240-acre (1.0 km2) city park. Welcome sign on WIS 35 / US 18. The city gives its name to the Prairie du Chien Dolomite, a layer of dolomite widely found in western Wisconsin. As of the census of 2010, there were 5,911 people, 2,386 households, and 1,367 families residing in the city. The population density was 1,049.9 inhabitants per square mile (405.4/km2). There were 2,594 housing units at an average density of 460.7 per square mile (177.9/km2). The racial makeup of the city was 93.6% White, 4.5% African American, 0.4% Native American, 0.3% Asian, 0.3% from other races, and 0.9% from two or more races. Hispanic or Latino of any race were 1.2% of the population. There were 2,386 households of which 26.6% had children under the age of 18 living with them, 41.9% were married couples living together, 10.9% had a female householder with no husband present, 4.4% had a male householder with no wife present, and 42.7% were non-families. 37.6% of all households were made up of individuals and 17.8% had someone living alone who was 65 years of age or older. The average household size was 2.18 and the average family size was 2.86. The median age in the city was 41.4 years. 21.6% of residents were under the age of 18; 8% were between the ages of 18 and 24; 24.9% were from 25 to 44; 27.3% were from 45 to 64; and 18.3% were 65 years of age or older. The gender makeup of the city was 52.4% male and 47.6% female. As of the census of 2000, there were 6,018 people, 2,376 households, and 1,473 families residing in the city. The population density was 1,075.9 people per square mile (415.7/km²). There were 2,564 housing units at an average density of 458.4 per square mile (177.1/km²). The racial makeup of the city was 95.06% White, 3.61% Black or African American, 0.28% Native American, 0.17% Asian, 0.02% Pacific Islander, 0.08% from other races, and 0.78% from two or more races. 0.88% of the population were Hispanic or Latino of any race. There were 2,376 households out of which 29.3% had children under the age of 18 living with them, 48.7% were married couples living together, 10.2% had a female householder with no husband present, and 38.0% were non-families. 33.0% of all households were made up of individuals and 17.1% had someone living alone who was 65 years of age or older. The average household size was 2.28 and the average family size was 2.92. In the city, the population was spread out with 24.2% under the age of 18, 11.4% from 18 to 24, 24.3% from 25 to 44, 21.8% from 45 to 64, and 18.3% who were 65 years of age or older. The median age was 38 years. For every 100 females there were 100.5 males. For every 100 females age 18 and over, there were 97.3 males. The median income for a household in the city was $34,038, and the median income for a family was $43,444. Males had a median income of $29,595 versus $20,183 for females. The per capita income for the city was $17,680. About 6.4% of families and 8.1% of the population were below the poverty line, including 11.7% of those under age 18 and 4.8% of those age 65 or over. A monument to Fr. Marquette, located in Prairie du Chien. Prairie du Chien has five National Historic Landmarks and nine sites on the National Register of Historic Places representing its significant history. The five Landmarks were the first designated in the state. It is close to Wyalusing State Park in Wisconsin, and Effigy Mounds National Monument and Pikes Peak State Park in Iowa, sites of natural and manmade wonders. Its rich history and location by the Mississippi River, make the city a popular destination for tourists. The Prairie Villa Rendezvous, a gathering to recreate the atmosphere of a 19th-century fur trading camp, has been held annually in the city every Father's Day weekend since 1975, it attracts tens of thousands of visitors. In 2001, Prairie du Chien gained brief national attention for its first annual New Year's Eve celebration, during which a carp from the Mississippi River was dropped from a crane over BlackHawk Avenue at midnight. The "Droppin' of the Carp" celebration has been held every New Year's Eve since. Hunting and fishing have long been popular in the area. The opening of Cabela's fourth outlet store in the city in 1998 firmly established the city as a destination for sportsmen. Prairie du Chien is served by the Prairie du Chien Municipal Airport (KPDC). The annual 7-day, 500-mile supported bike tour of Wisconsin known as GRABAAWR begins in Eagle River and ends in Prairie du Chien. St. Feriole Island has a long riverfront with a park, connected to a bike path that goes around the island. Shelters can be used for large events. Across from the Villa Louis is a large open field that was once used as a horse racing track. On the far end of the field are two large soccer fields. Pets are allowed to run in the large fields as well. Lucy Eldersveld Murphy, Great Lakes Creoles: A French-Indian Community on the Northern Borderlands, Prairie du Chien, 1750-1860. New York: Cambridge University Press, 2014. Prairie du Chien, Wisconsin Facts for Kids. Kiddle Encyclopedia.